Pudding Up with Murder by Julia Buckley is a cute culinary cozy mystery with recipes included. Amazon affiliate links are used on this site. A free ARC was provided for an honest review. 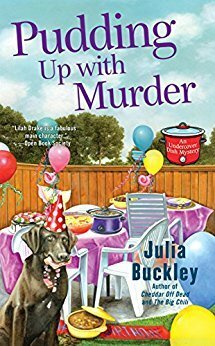 While Pudding Up with Murder is the third book in the Undercover Dish Mystery series, it is my first book by Julia Buckley. I don't think it will be my last. I liked the main character, Lilah Drake. She is a chef who works at a local catering company and appears on the local cooking television as the Friday guest chef. But the interesting part of her occupation is as a secret cook. She whips up culinary delights for customers to pass off as their own. I'm not sure how long she'll keep this under wraps as her clientele are all referrals. And since it seems that these secret dishes are present when murder is on the menu, it may soon become a secret everyone knows. In Pudding Up with Murder Lilah makes a rice pudding for her friend Ellie (who is also the mother of her boyfriend) to take to her neighbor's birthday party. The old man next door is a bit odd, but Ellie seems quite taken with him. He likes dogs and Ellie asks Lilah to bring her dog Mick to the party. The man has a number of ex-wives and is presumed to be quite well off. So when he kills over dead at the party there are plenty of suspects including Lilah's rice pudding. Buckley has created a fun cast of characters. Some of them have probably shown up in the previous books - best friend, co-workers - and then there is the Cantwell family who appears for the first time (I assume since I haven't read the previous books, but they are the focus of the murder case). I thought Buckley did particularly well creating Tim and Emma's kids. Lilah's boyfriend Jay is a local police detective and he is in charge of the investigation. (I get the impression that the town they live in is small, but perhaps it just has a small town feel since the police station is always described as being busy.) Even though Jay grew up next door to the Cantwell's he knows he won't get all the answers he's looking for. So he asks Lilah to keep her eyes and ears open, and she does just that and more! If you are like me and haven't read the series, you won't have any problem with knowing who is who. Since this is only book 3, even the plot threads that carry over from the previous books are easy enough to follow. If you are looking for a culinary cozy mystery, then definitely check this one out. I'm looking forward to making a couple of the recipes.